Unless you are content to fish blindly and sit around waiting for random nibbles, you’ll have to find the fish to have any degree of success on the water. A good sonar unit can make this easier, but as most advanced anglers know, you need to find more than just the fish – you need to find the structures and underwater features they frequent. When you are trying to identify cover and structure, you’ll need a fish finder that can provide plenty of detailed images. Suitably detailed images will allow you to inspect and work sunken logs, weed lines and rock piles precisely, rather than just chucking your lure at them and hoping for the best. But you needn’t spend thousands of dollars on a state-of-the-art fish finder to enjoy access to supremely detailed images. There are a number of mid-level fish finders that can provide you with a highly detailed portrait of the world beneath the waves. The Garmin STRIKER 5cv is one such model, and it provides a number of different ways to get a good look at your quarry’s domain. The STRIKER 5cv isn’t the most advanced unit on the market, but it is a very capable fish finder that deserves consideration by serious, yet budget-limited anglers. 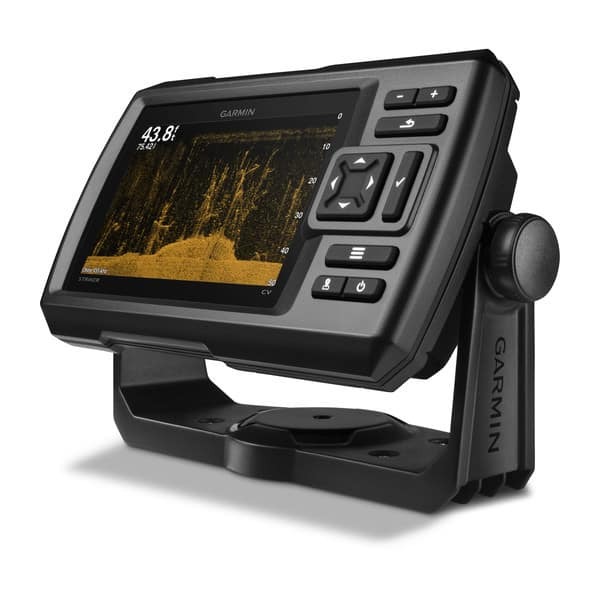 However, there are a few competitors that provide superior capabilities at this price point, so the Garmin STRIKER 5cv earns a B- grade from Fishing Tech. While the primary purpose of a fish finder is to detect and display information about the underwater world, you’ll want to use this information in conjunction with geographic data to maximize your ability to find and catch the fish. The STRIKER 5cv allows you to do exactly this, thanks to the built-in GPS unit. You can use the STRIKER’s GPS module to mark productive fishing spots with the waypoint feature and then find these spots again with the navigation feature. CHIRP technology provides more detailed images than traditional sonar units do, by emitting a sweeping range of frequencies, rather than a single-frequency signal. CHIRP technology not only provides greater detail than traditional sonar technology does, but it also provides greater target separation, which will allow you to distinguish between individual fish more effectively. The transducer included with the STRIKER 5cv isn’t limited to CHIRP technology; it also includes a powerful scanning sonar module, which Garmin calls ClearVu. With ClearVu sonar technology, the Garmin STRIKER 5cv enables you to see nearly photographic quality images of the underwater world. With such high-quality images, you’ll be able to target a given branch on a given sunken log or scattered pieces of cover with ease. The Garmin STRIKER 5cv not only works for traditional fishing techniques, but you can also use it for vertical jigging over suspended fish, thanks to the included flasher unit. By activating this mode, you’ll be able to strip away any unnecessary data and concentrate solely on the depth of the fish, the bottom and your lure. The included flasher unit also works very well for those who like to fish through the ice. Water-resistance is important for any type of boat-mounted electronics, and Garmin has taken this into consideration with the STRIKER 5cv. Supremely sealed and resistant to splashing, spraying and even submersion, the STRIKER 5cv earns an IPX7 Water-Resistance rating. This means that you can fish in even the roughest weather without worrying about your fish finder failing. Additionally, because it can withstand being submerged briefly, it is an excellent option for those who fish from kayaks and canoes. It doesn’t matter how much data a fish finder collects if you can’t use and access it all effortlessly. Fortunately, the Garmin STRIKER 5cv features an intuitive user interface, which makes it easy to navigate the various menu screens and tweak the settings of the unit. This way, you’ll be able to concentrate on catching fish, rather than fidgeting with your fish finder. In order to use the copious amounts of data the STRIKER 5cv collects, you’ll need a high-quality display to visualize this data. But while many mid-level fish finders have mediocre displays, the STRIKER 5cv has an excellent display, which produces crisp, clear images. The STRIKER 5cv’s GPS module was very well-received by most anglers who tried the unit. GPS capabilities not only allow you to mark productive fishing locations, but you can revisit them easily too by using the navigation feature. You can even determine your traveling or trolling speed with the GPS unit. Does not have chart-plotting capabilities. Anytime you are shopping for a fish finder, you want to compare the item you have your eye on with other available fish finders to ensure you get the most value for your dollar. This includes both the other models produced by the manufacturer in question and those produced by competitors. The STRIKER 5cv is a mid-level model in the STRIKER series, meaning that there are both better-equipped options and more affordable options in the line. The STRIKER 7cv represents the next step up in features and capabilities, although the biggest difference between it and the 5cv comes down to display size. Similarly, the STRIKER 4cv is broadly similar to the 5cv, but it has a smaller screen and boasts a lower price point. It is important to note that the Garmin STRIKER 5cv is an updated – but essentially identical – version of the STRIKER 5dv. The change resulted from a legal issue over the use of the term “DownVu,” so Garmin now uses the term ClearVu when describing their scanning sonar technology. Although there are a number of fish finders that are similar to the Garmin STRIKER 5cv, the two that are most similar include the Raymarine Dragonfly 4PRO and the Lowrance HOOK-7. The Dragonfly 4PRO is a fish finder/GPS combo unit, but it provides more features than the Garmin product does. This includes things like a microSD card reader and Wi-Fi compatibilities. Additionally, the Dragonfly 4PRO is capable of chart-plotting and comes preloaded with maps, while the STRIKER 5dv does not provide chart plotting functionality. The Dragonfly PRO screen is also specially designed to provide crystal-clear images in any weather conditions, and it is guaranteed not to fog up during use. The Lowrance HOOK-7 and the STRIKER 5dv have broadly similar features and capabilities, but – like the Raymarine unit – the HOOK-7 provides chart plotting capabilities. The HOOK-7 also boasts a screen that is 2 inches larger than that of the STRIKER 5cv. This makes it much easier to view split-screen displays and appreciate finer details than are possible with the STRIKER 5cv. While you may be able to find slightly better-equipped fish finders at this price point, many anglers will still prefer the STRIKER 5cv over those produced by other manufacturers. It is certainly a viable option for experienced anglers, who are interested in stepping up from the entry-level category, yet still have budgetary limitations to consider. On balance, the STRIKER 5cv is a solid fish finder, and it earns a B- grade from Fishing Tech.